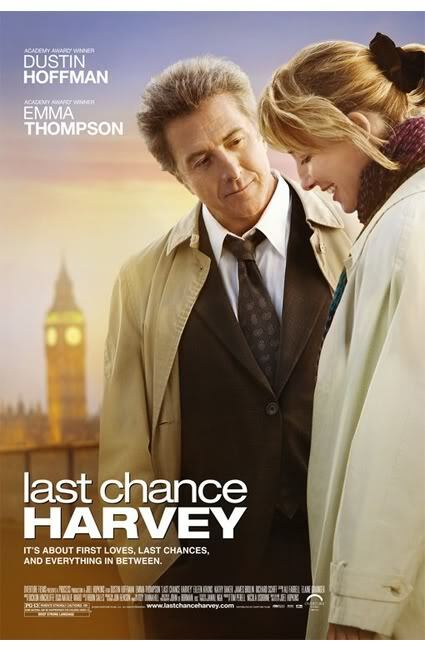 This is the US poster for Last Chance Harvey, a romantic comedy starring Dustin Hoffman and Emma Thompson. Looks great guys. 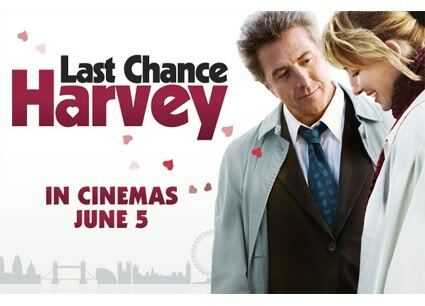 Just one thing though, this is a romantic comedy right? Surely we can make that a bit more obvious. Can you shove in some hearts and stuff? And where’s the pink? If it’s romantic, it NEEDS pink. Also, why is Hoffman dressed up like Gene Hackman in The Conversation? Can’t we have him wearing a blue jacket? Oh, and why a brown tie? He looks like somebody’s grandad. Make that blue too. Finally, I like what you’ve done with Big Ben, emphasising the London setting and all. They’ll love that in the UK. But can’t you get more landmarks in? It needs to be mind-numblingly obvious that it’s set in London. Thanks and I look forward to seeing the UK poster.